When Chris Vail of Janis Trading Company announced the NTH DevilRay back in June, it was clear that he and his design team had cooked up something special. Vail cited influences ranging from 1970's dive watches to medieval armor and modern tank treads, and while it sounded weird, it looked good. I've been dying to see how it all came together and I recently got my chance, with not one but two prototypes of these cool, curious beasts in hand. 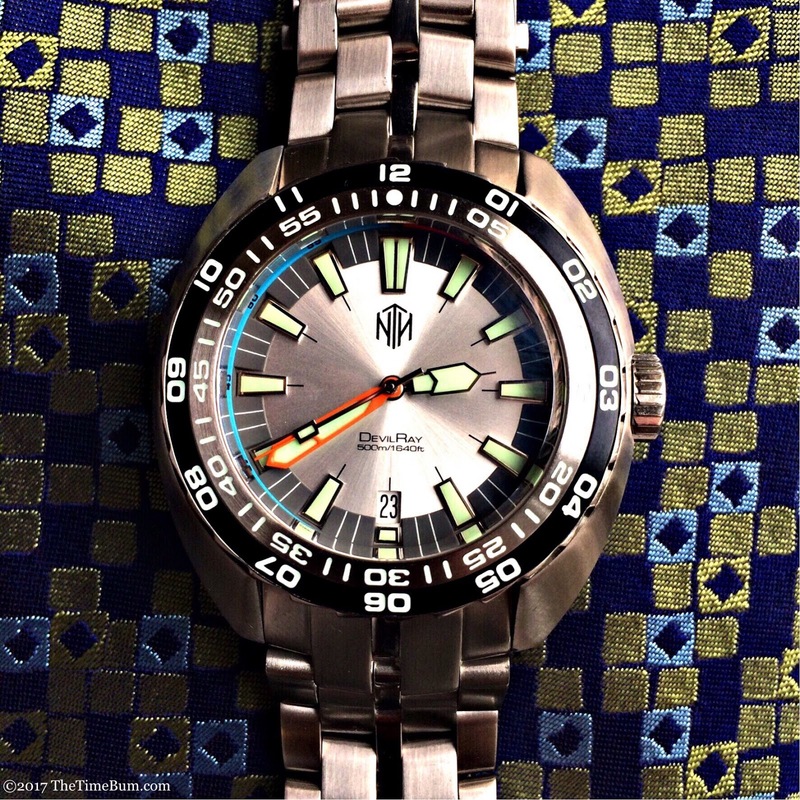 The DevilRay is a 500m diver running the 26 jewel STP1-11 automatic movement, also found in the NTH Tropics series. The STP is emerging as an appealing alternative to the ETA 2824-2. 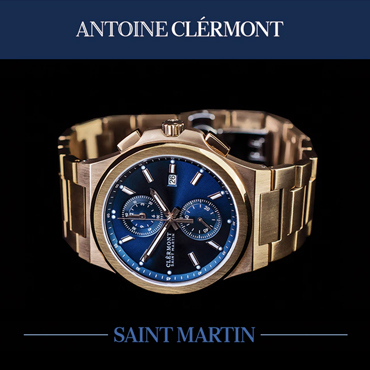 It has a smooth sweeping 28.8k bph vibration rate and a 44-hour power reserve. Like the Certina DS watches that inspired it, the DevilRay has a broad, turtle-style case that falls away from the bezel and tapers at the edges for a smooth, organic shape. A polished edge bisects the brushed upper and lower surfaces of the case, terminating in clipped lugs. 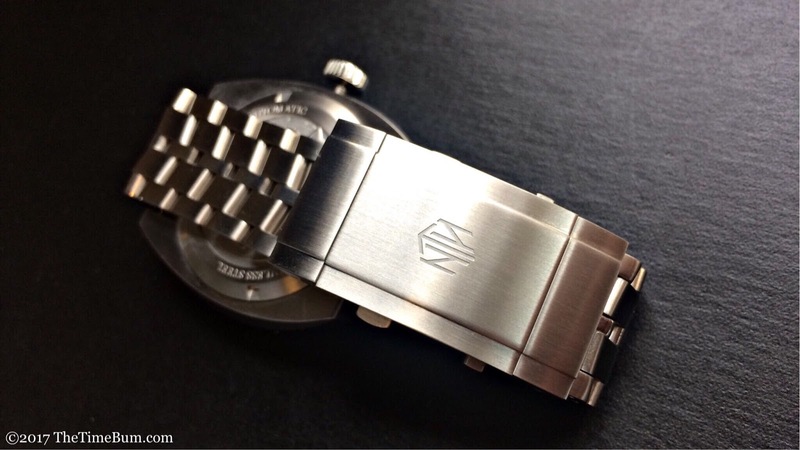 It measures 43mm wide, 13.5mm thick, and a remarkably compact 46mm long. It is topped with a double domed anti-reflective sapphire crystal. Flip it over, and you will find a stamped image of its namesake creature. 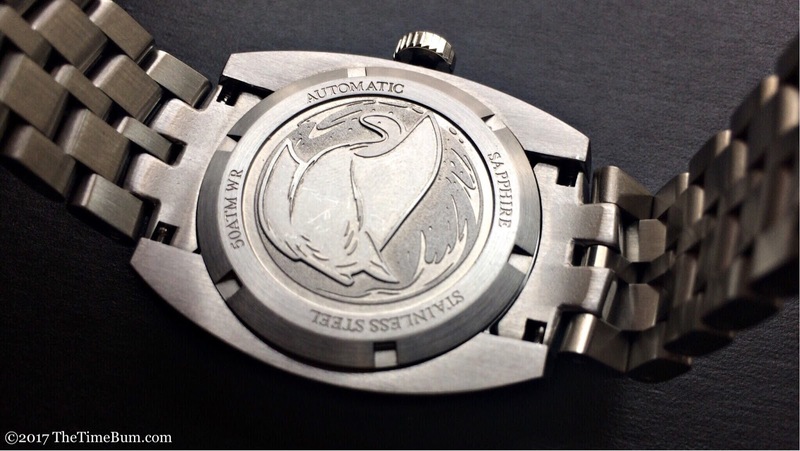 Set into this winged shape is a comparatively small 40mm bezel. 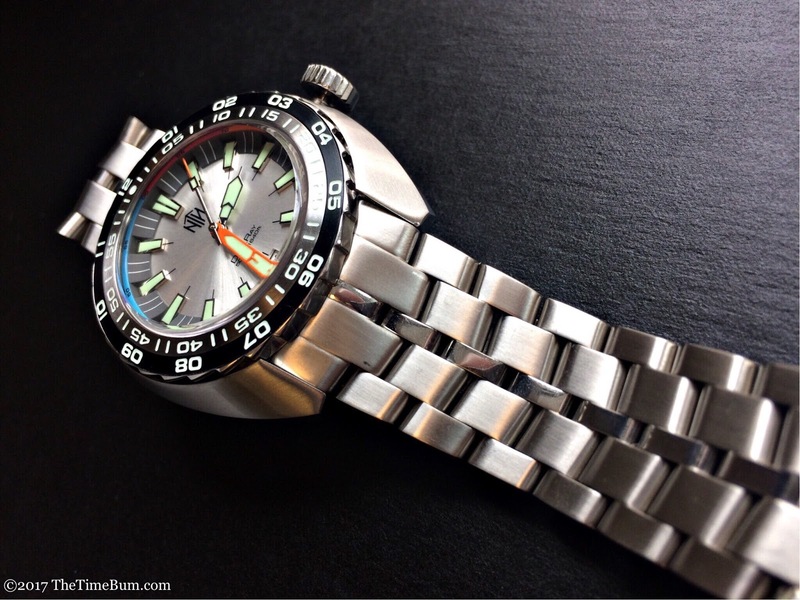 Like those on Doxa Subs watches, it is saw-toothed and divided into two distinct indexes, in this case, 12 on the DLC black outer ring and 60 on the brushed steel inner ring. Note that the teeth are polished on the prototype, but will be vertically brushed in production. 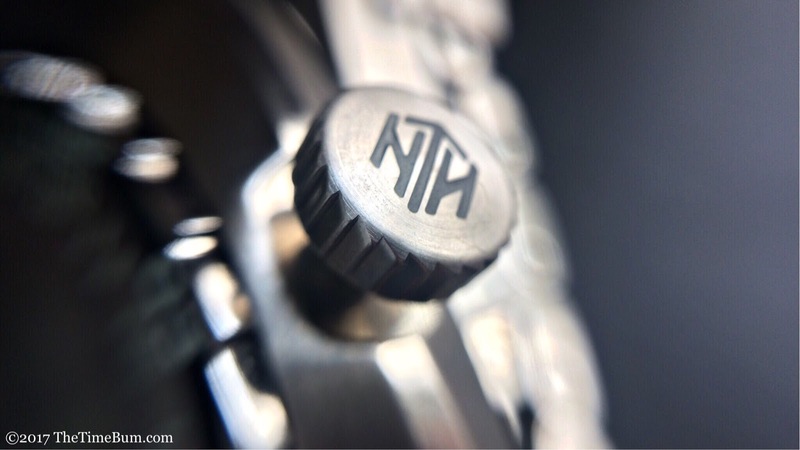 Unlike the Doxa, the NTH bezel is channeled, so the case sides act as a shroud. It is a design that has its pros and cons. The tall-shouldered look is attractive, and there is little chance that you will inadvertently move that bezel, but it also effectively limits your range of motion to the 22mm area between the lugs. Of course, this issue is not unique to the DevilRay. I have found the same limitations on Tuna Can Seikos and others with a shrouded design. It may move in short steps, but the action is firm and precise as it travels through its 120 clicks. 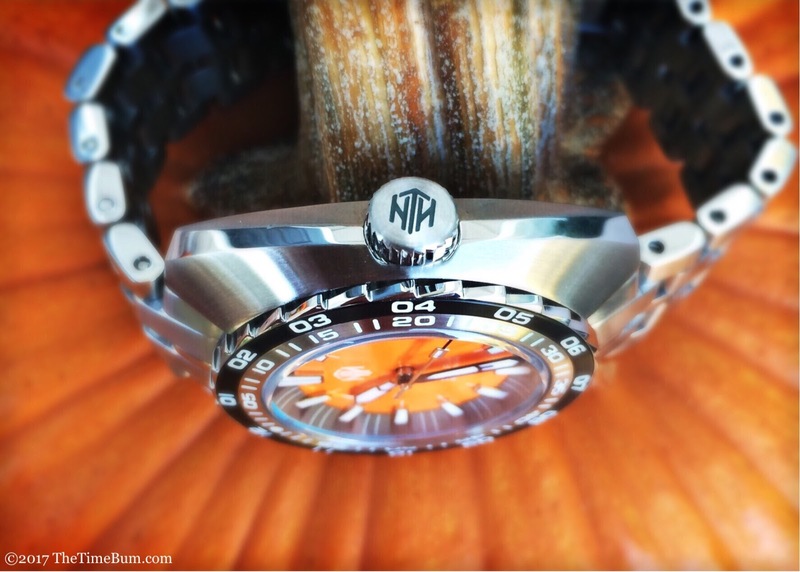 Like other NTH watches, the screw down crown is signed and lumed. I appreciate the way Vail has refrained from using oversize crowns on these watches. 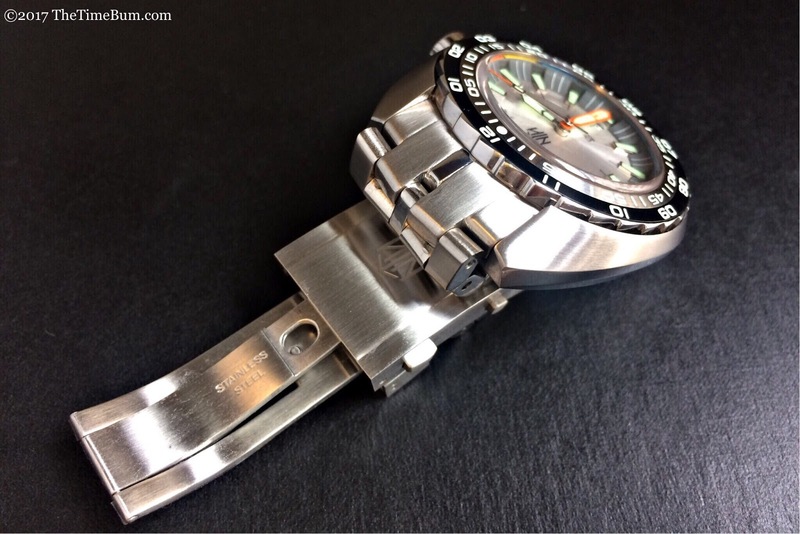 I know they are common on many diver's watches and can make it easier to set when suited up for scuba, but they don't always work aesthetically. The DevilRay's is a very reasonable 3mm thick, providing more than adequate area to grip without disrupting the otherwise flowing lines of the case. For a real treat, get close and squint at the edge of that crown so you can appreciate the way it is saw-toothed just like the bezel. The DevilRay is an excellent example of how clever sculpting can change the way a watch will look on your wrist. Doubtless, a 43mm case has a big footprint, but the DevilRay's short lug-to-lug length, curved surfaces, and modestly sized face create a lean, tailored look that in no way lacks presence. It neatly fits my 6.5" wrist, and even though it is undoubtedly a sports watch, I wore it under buttoned oxford without complaint. The dial is a richly detailed affair. 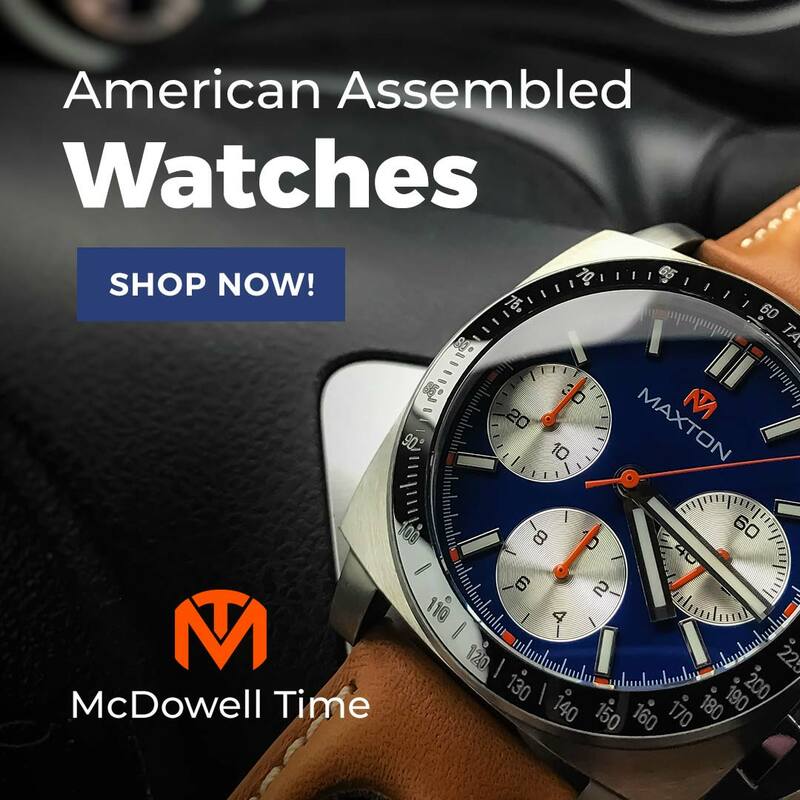 An angled minute ring surrounds it, cut away to expose thick polished markers applied to a dial that is either a brightly colored turquoise or orange, or a sun-brushed finish in black or white. Vail sent me the no-date orange dial and the date window white dial prototypes for my evaluation. For the record, the "white" is silver. Dial text is rendered in a sparse, lightweight, typeface and small caps font for clean, appealingly retro look. I really like the handset's 1970's style: the hour hand is a stubby polished rocket shape with an extended needle tip, the minute hand is an orange sword, and the second hand is a polished paddle with an orange tip. 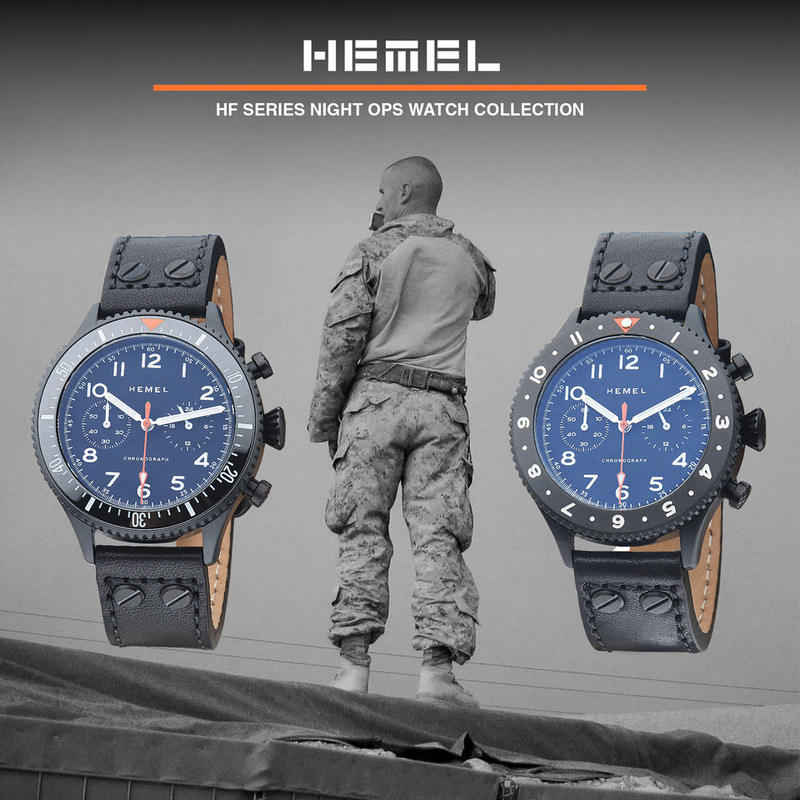 It is clean, sporty, and legible, but as with other aspects of this watch, there is more at play here than first meets the eye. Note how the top of the hour hand matches the length of the index at the edge of the hour markers; how the detail 2/3rds of the way up the minute hand matches the tip of the hour hand; how the paddle on the second hand crosses right over that point on the minute hand; and further, how the paddle is the same width as the ends of the markers, and the orange tip matches their length. Lovely. Really lovely. 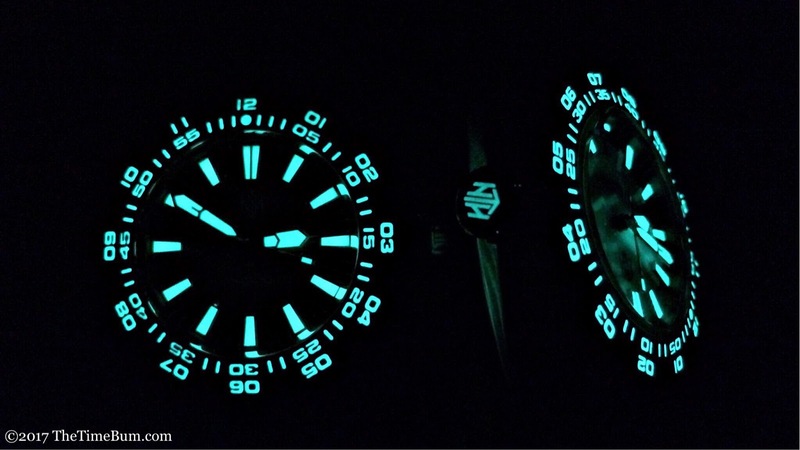 As we have come to expect from NTH, the lume is amazing. 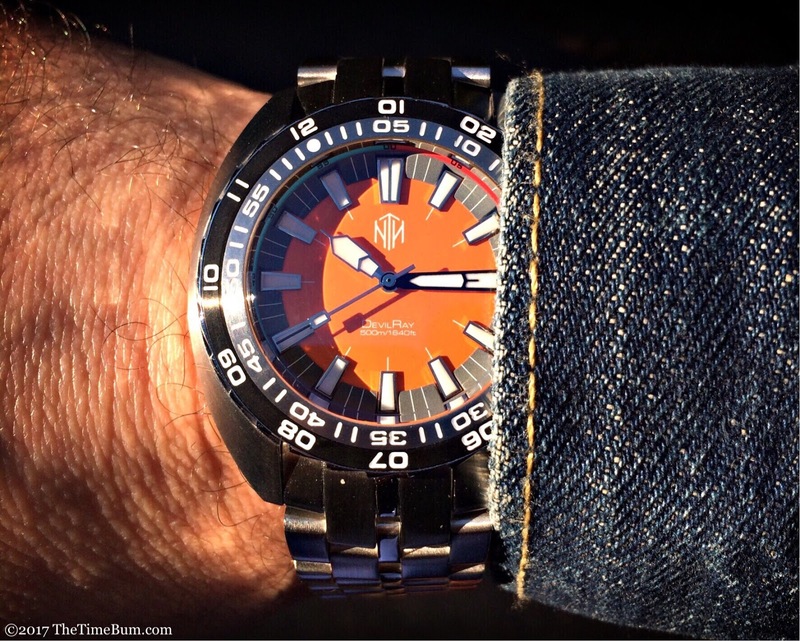 Vail went with the new Tritec X1 SuperLuminova on the hands, markers, bezel, and crown. 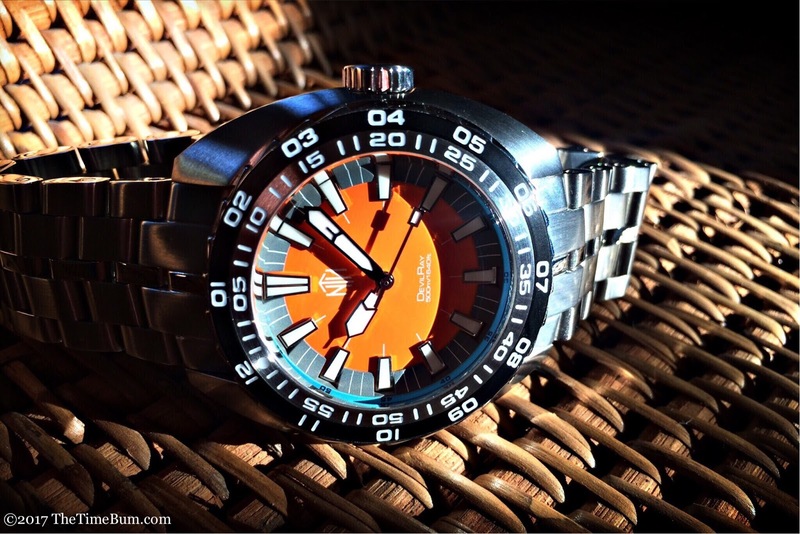 Orange and turquoise dials get bright white GL lume, and white/silver and black dials get the greenish-white C5 color. Both glow green, and glow strong. Kudos to Vail for luming the entire bezel index and not just the pip. One of the more intriguing aspects of the dial is so subtle it is almost lost. 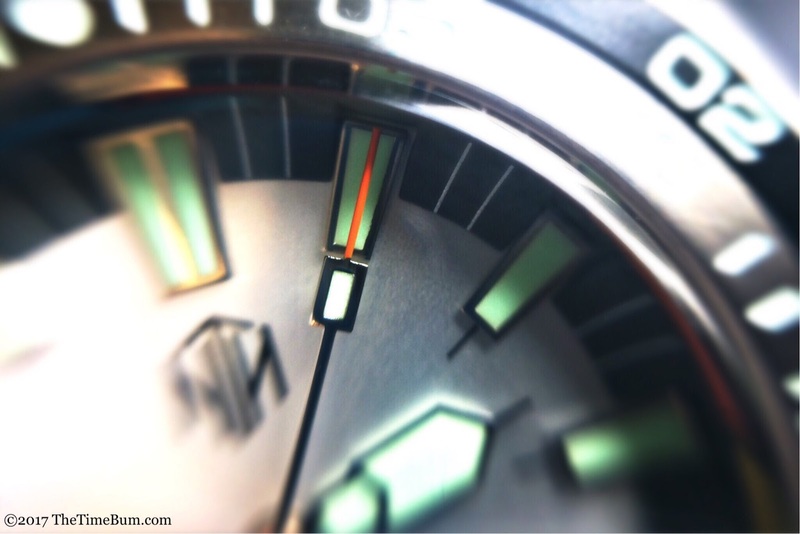 A multicolor depth meter decorates the very edge of the dial. If you dig back into your brain to your high school science class, you will recall that the different colors in the light spectrum have different wavelengths. As light passes through water, the shorter wavelengths (starting with red) disperse. The deeper you go, the more colors disappear until only the longest (blue) remains. So if you glance at your color depth index and can still see the red segment, you know you are not yet 10m down. Orange disappears around 20m. Yellow is gone by 30m. After about 45m, all you will see is the blue segment. On the DevilRay, you probably won't see much of anything because the index is so narrow that the edge distortion on the crystal obscures it, making it impossible to read head-on. You can only catch a glimpse of you look at an angle, and you might as well give up on the seconds index printed on top of it. It is just too tiny. The meter/index is wildly impractical, and yet, I don't mind at all. Why? Because judging depth by color yields little more than a very rough guess. The actual rate of light dispersal depends on the clarity of the water. In practice, the colors may be filtered at depths far shallower than those listed above. The depth meter is a nifty throwback, and a pleasant hint of color, but an imprecise tool. 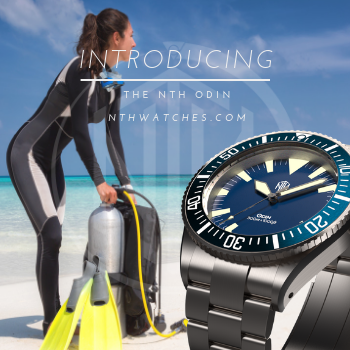 If you plan to scuba with this watch, get yourself a modern, accurate depth gauge to go with it. The DevilRay comes on a custom 5-link bracelet, and it is a beauty. Its short, angular links form a chevron pattern (this was the tank tread idea) that looks and feels fantastic. Every link secures with a single screw for easy removal and a wide range adjustment. All are brushed except for the narrow center links, which are polished, tying them to the polished case edge. The prototype links have polished sides as well but will be brushed in production. NTH offers a variety rubber straps at a discount as an option with this watch, but the bracelet looks so damn good, I'd probably never take it off the watch. The bracelet secures with ratcheting clasp similar to the piece used on the Tropics. In my review of that series, I took issue with its thickness but said it would be perfect if NTH ever did a big diver. I was right. The boxy clasp looks right at home here. My only criticism is that the corners of the prototype are just a bit too sharp. They don't contact your skin and are in no way uncomfortable, but I wouldn't want to accidentally scrape them against a wooden tabletop or a leather armchair. Vail tells me this will be rectified before production. Once I took some initial photos, I sized the bracelet on the silver dial and proceeded to wear it for the next four days straight. 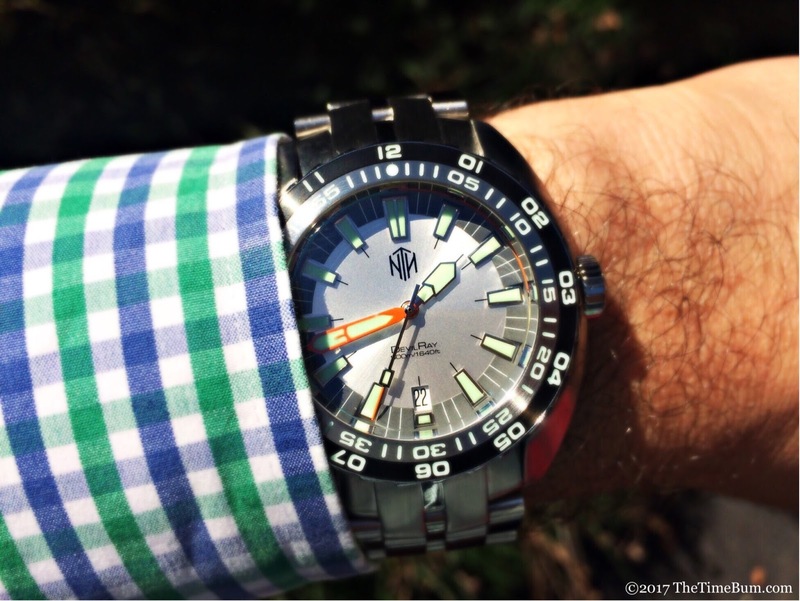 It proved to be a sharp looking weekend warrior, and when Monday rolled around, I broke my "no tool watches with a suit" rule and wore it anyway. It's a bit much for a dark suit, but the silver dial worked rather well with a sportcoat.